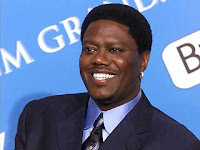 Just saw the devastating news on FoxNews.com that actor/comedian Bernie Mac has died at the age of 50. My first real exposure to Bernie Mac was his role in Ocean's 11 and his unforgettable "hand lotion" scene. A comedic genius. God rest his soul. Mostly knew him from "The Bernie Mac Show", which was very funny at times. Now we have lost Issac Hayes as well. Wonder who will be the third to round out the triple play?